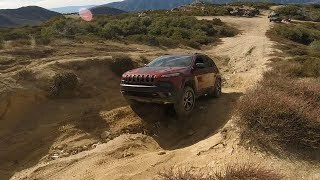 2019 Jeep Cherokee Trailhawk Elite 4x4 Review - Trail Rated? So What? 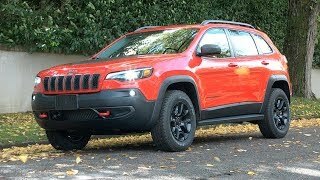 Who cares if this loaded Elite version of the 2019 Jeep Cherokee Trailhawk is "Trail Rated?" It's honestly a good driving vehicle ON the road, too! M.S.R.P. - $41,150. How would it compare to the 2020 Subaru Outback, I wonder? 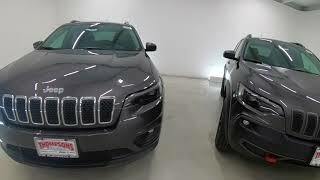 Traded my 2015 Cherokee for a 2019 Trailhawk. I love it! Some small issues with the 15, but the 19 has it all fixed. 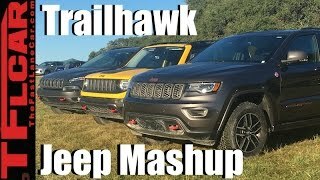 What's the difference between the "Elite" and non-Elite Trailhawk trims? And it has more of the fancy things like the heated seats, hands free trunks. I got the normal version cause I don’t need all that stuff. Nice! Congrats on your ride, sev7da creater, and thanks for watching! Sure is, John Dickerson. Shame Jeep wanted it back, though. Thanks for watching! 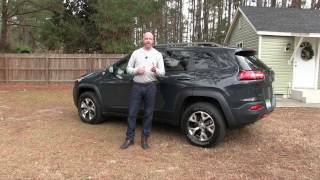 Jay Chapman yah I was looking at a used 2017 Chevy pickup or 2019 jeep Cherokee Trailhawk. 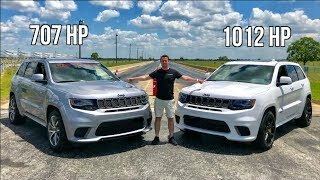 Hated to trade in my 2008 WRX but I needed something newer and more room so the Jeep won. +Michael Carter on that note I did want the trail hawk over my f150. The wife hated the look. I liked the capability though. You can go 2” inches and still keep warrenty. Prob on my list later in the year or when I get closer to replace tires next year as I’ll switch to some better tires than. For now and daily driving it’s ok. Thank you, Perry Bonner. You should see Chris after he's had some candy! LOL We appreciate your comments and thanks for watching! Chris: For once I'd like to see a new car that was just "New" rather than "All New". WTF does "All New" mean anyway? Not much, I suspect. 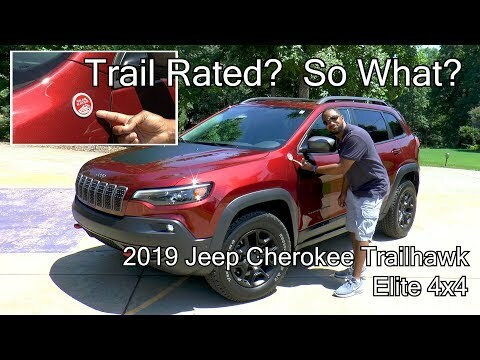 Please learn what the "Trail Rated" badge means. 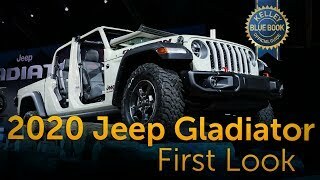 Not every Jeep model gets the badge. It means the Jeep model in stock configuration completed the Rubicon Trail. No easy task. Also those tires are not loud. You want loud, throw on some real off-road tires. Not all new. Mid cycle refresh. 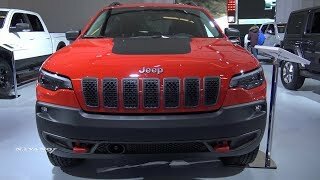 Just upgraded my 2014 Trailhawk to the first one in the video. I love it. Congrats on your new car, Xerede. Thanks for watching! I wanted one over my f150. My wife hated the Cherokee and we ended up with an 09 f150 King ranch. Thanks for watching, R. E. Rankin! Great review! 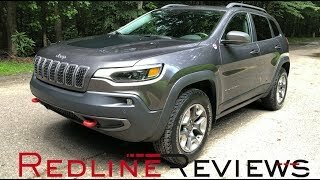 Just got my 2019 TrailHawk 2 1/2 weeks ago and LOVE it!!! I'm really impressed with the fuel economy so far. I have the 3.2 engine and I'm getting 25 miles to the gallon (higher than what it's rated for). That's not highway driving either. I'm mostly on country roads in the Pocono mountains with some stop signs and traffic lights. I haven't gone off-road yet, but I will. I'm actually looking forward to some snow this year knowing that I wont get stuck or have to call out of work. Thank you for sharing, Larry Has. 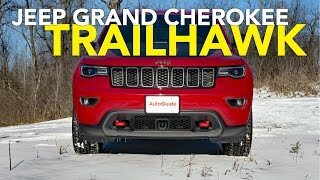 That Trailhawk should be fantastic in the snow. Enjoy and thanks for watching! 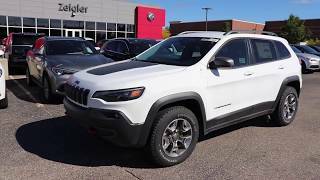 I have a 2014 (v6) Trailhawk with over 120,000 miles now and started using an ultimate synthetic oil and just got 27 mpg on a 5,000 mile round trip from SW corner NM to UP of MI just one month ago. Last weekend I was (back) up in White Mountains of AZ (see Alpine, AZ) and was in low-range 4WD in rock mode and crawling up and over (real) mountain top terrain to get into the dominant bull elk country for sighting and bugling-listening. Push the button, turn the dial, and you go from near-max-possible off-road (back) to street-machine-perfect, including a sport mode that makes it go like a Porsche in the (real) mountain switchbacks, paved or gravel. Very awesome for the price. 1" more clearance would be better via a little bigger wheel-wells to allow for 33" off-road tires would be all it needs (stock k02s) for ultimate clearance. Add a little bull-bar and roof-top rack ... then call that version the Trailwolf instead. :) ..... 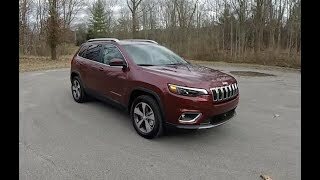 The ratio of wider wheel width vs. narrower upper cabin makes for a low center-of-gravity and that makes for a very sporty ride vs. most SUVs. For perfection: 2" longer in the hatch-back area and a little tougher off-road struts for the front due to all of the engine weight directly over the wheels - again, for stock-perfection so that no after-markets are needed (I upgraded to Bilstein struts at 100,000 miles and the KO2s at 70,000). As noted, wish I could fit some 33s in the wells. 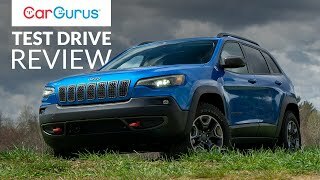 FYI: It hits 9th gear at 84 mph, so they could use the same 8-speed as in the Grand Cherokees and it would be fine. .... And interior trim color should be 'gold/bronze' not 'silver/aluminum' (would be my preference). Mine: Both front seats are heated and so is the steering wheel (and I like that now that I'm pushing 60), and I got all that for $38,000 back in 2014. 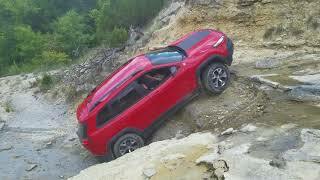 Sounds like you're using your Trailhawk the way it's meant to be used, OdinVonTogan, and enjoying every minute of it. Thanks for sharing and for watching! Typical A/T tires are not loud. 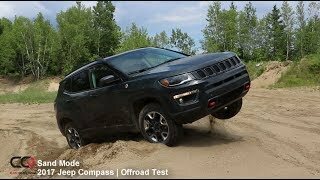 You have to get into tires with true off-road tread like BFG KO2s. Even those are not very loud on the street. 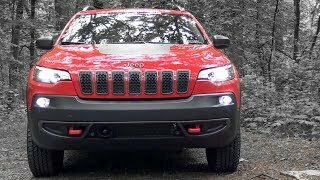 As far as hate, yes the Cherokee gets hate mainly because the modern ones are just neutered Grand Cherokees. 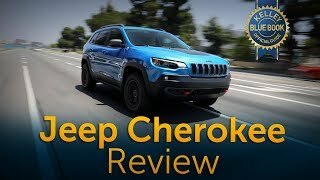 Real Jeepers were hoping for a retro style Cherokee based on the XJ. Sadly FCA decided otherwise. Hi, RiseAbove300. 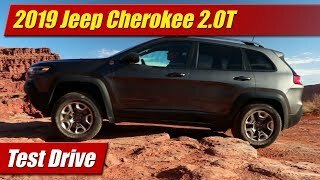 Considering the type of all-terrain tires on this Cherokee, they weren't that loud at all. This vehicle drove very well. Hope this helps and thanks for watching! Love my '19 TH. Traded up from a '17 when i heard of all the little updates and changes they made. Quite a few TH owners are reporting 26-30mpg highway. I'm usually around 25mpg when not using 4Low. That's some pretty good mileage, Fearless Trailhawk. Thanks for sharing and for watching, too! Thank you, Dan Pitre! The Cherokee is a very capable vehicle for all kinds of weather. We appreciate your comments. Thanks for watching! Great review, but CJ all you had to do was follow the damn train! Great Review. I would get the Limited trim with active drive I and the 2.0T. I’ll stick to my very capable 2005 Toyota Land Cruiser. Thank you, Alejandro Garcia! We appreciate your comments. Thanks for watching!